Machu Picchu is not an easy place to get to. From the town of Cusco it took 90 minutes by car to get to the Peru Rail Dome Train. (You can take the train from Cusco but not during the rainy season due to mud and rock slides.) Then it takes another 90 minutes to go 27 miles to the town of Aguas Calientes at the base of the mountain. From there you have a 10 minute walk to the center of the town where you board a bus that takes you up a narrow, one lane, twisty road with 18 switchbacks. After 30 minutes you arrive at the top at 8000 ft. After walking up a lots of steps you see the breathtaking city. And actually that is the easy way to get there! If you want you can hike there and it will take you four days and three nights. Machu Picchu was built around 1450 and was probably the most amazing urban creation of the Inca Empire at its height. Its giant walls, terraces and ramps seem as if they have been cut naturally in the continuous rock escarpments. The natural setting, situated in the midst of a tropical mountain forest on the eastern slopes of the Andes, encompasses the upper Amazon basin and is extraordinarily beautiful. 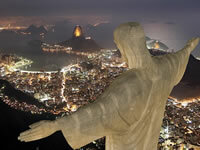 The statue of Christ the Redeemer is located at the top of Corcovado Mountain and commands a panoramic view of the city and the bay. 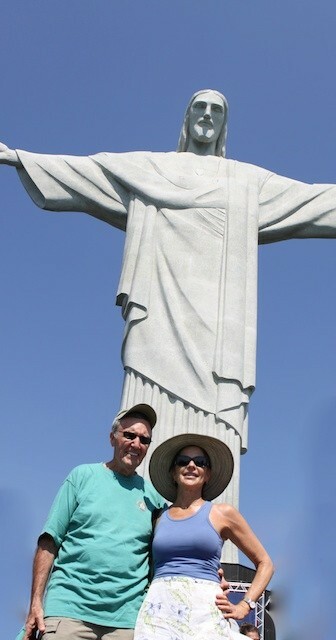 The entire monument of statue of Christ the Redeemer is 125 ft high with the statue accounting for 98 ft and overlooking the city of Rio de Janeiro is one of the tallest statues in the world; the span from finger tip to fingertip is 92ft and there is a small chapel housed in the base. Heitor da Silva Costa was the engineer who designed the statue. Construction was started in 1927 and completed in 1931. This was much easier to get to. It took 15 minutes to get to the train station and then a 20 minute ride to the top. From there you have 222 more steps to reach the base of the statue. In the summer of 2007, more than 90 million people cast their votes to determine which architectural marvels in the world deserved to be one of the New Seven Wonders of the World. There were a total of twenty-one landmarks vying for that title. 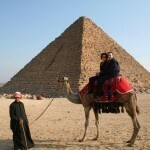 Of the Seven Ancient Wonders of the World, only the Great Pyramids in Giza, Egypt still stand. The pyramids were given an automatic spot after infuriated Egyptian officials said it was a disgrace to have to compete for something that had belonged to their country for so long. I agree! We saw them in 2007. It is our goal to see all twenty-one landmarks. Also, Chris and I have collectively seen a lot of the twenty-one, however, not together. So the rule is, we go back and see all of them together!